 El Monte, Los Angeles County: Hilldale in 2015 was shot at Somserset Street & Oakhurst Street in a private neighborhood off Gilman Road in El Monte. The McFly house was at 3793 N. Oakhurst Street.  Griffith Park, Los Angeles, Los Angeles County: Griffith Park Tunnel.  Hollywood, Los Angeles, Los Angeles County: First United Methodist Church, 6817 Franklin Avenue.  Monrovia, Los Angeles County: Jennifer's house was filmed at 161 N. Magnolia Avenue between E. Foothill Boulevard and Oaks Avenue.  Pacoima, Los Angeles, Los Angeles County: The McFly House was filmed at 9303 Roslyndale Avenue at Sunburst Street.  Pasadena, Los Angeles County: Gamble House, 4 Westmoreland Place.  South Pasadena, Los Angeles County: Biff's grandmother's house was filmed at 1809 Bushnell Avenue.  Universal City, Los Angeles County: Universal Studios.  Whittier, Los Angeles County: Whittier Union High School, 12417 E. Philadelphia Street. Strickland's House was filmed at nearby 12511 Bailey Street.  Wilmington, Los Angeles, Los Angeles County: The Oak Park Cemetery was temporarily built at the Valero Refinery, 2402 E. Anaheim Street by the Terminal Island Freeway.  "The Back to the Future Locations Archive" by Justin Willits and Anthony Peggs.  "The Back to the Future Tour by The Big Waste of Space" by Wesley Treat. 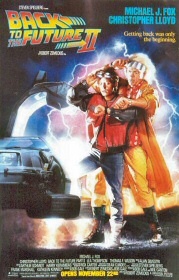  "Back to the Future  For Real!" by Bruce Gordon.